Use for disaster relief tents, storage facilities, sleeping tents, office tents, TOC’s, and more. Use EverBase flooring together with EverBlock to divide tents for various functional need. EverBlock is perfect for military tent flooring and disaster relief shelter flooring. From tactical operations centers (TOC) to sleeping tents and from kitchen and hospital tents to storage tents, EverBlock is the ideal system for remote deployment in harsh environments. From rapidly deployable shelters to larger scale warehouse structures, EverBlock can be used to keep personnel and equipment out of the mud, sand and dirt. 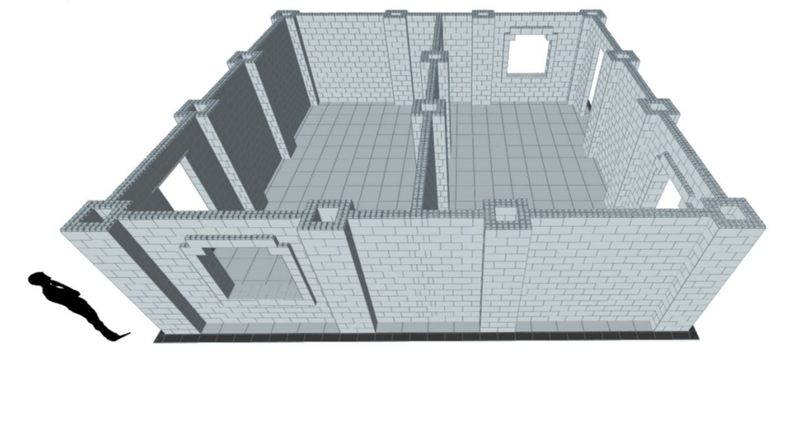 When combined with the EverBlock modular block system it is possible to create complete structures for all types of military and disaster relief structures. EverBlock Tent Flooring and Event Flooring System (EBF2) is ideal for corporate, industrial, military and event needs. EverBlock Flooring uses the latest technology in portable modular flooring and is designed for indoor or outdoor use. Each flooring system features integrated cable channels and bi-directional structural reinforcement cross-ribs for added strength and durability, as well as a smooth flat surface with hidden clip connectors. EverBlock flooring deploys quickly, stores compactly and can be transported easily. Whether on 463L pallets or standard commercial pallets, EverBlock stacks neatly and efficiently and is lightweight, at between 1/2lb - 1lb per sq/ft, allowing for efficient transport to remote locations. A large quantity of flooring can be fit on a single pallet, making EverBlock Flooring suitable for both ocean and air transport by cargo plane or helicopter. EverBlock flooring sections are molded from a high-impact polypropylene plastic, with UV additives, for outdoor use. EverBlock modules contain UV inhibitors for continuous outdoor use and feature a sand-blasted anti-slip surface, which is both easy to clean and provides good traction in wet conditions. Sections are reinforced with structural cross ribbing and manufactured using a high-impact Polypropylene plastic for long life and rugged daily use. EverBlock flooring allows networking and power cables to be run underneath the floor, for computers, communications, and other equipment, while flooring sections can be removed to handle site-specific obstacles. Cat 5/6 cables, power cables, and other communications cables can be run underneath the flooring, using the intragreated cable channel system that runs in both directions on every module. Staging risers, elevated platforms, and equipment can be placed on top of EverBlock flooring for command and operation centers, as flooring modules can support tremendous weights. Install multi-level risers as needed to create theater-style seating over the flooring below. Use a third party riser system, or utilize EverBlock's block riser system. Simply build a sub-structure out of EverBlock building blocks and place flooring tiles on top of the blocks to create a fully integrated riser. Build out re-configurable walls for MOUT and tactical training. EverBlock Flooring works with our standard EverBlock building block system, to create secure rooms within tents , to build rigid side walls and other solid enclosures, and to create risers for seating and equipment. EverBlock and EverBlock Flooring function together as a complete building system for all types of military and disaster relief functions and may be reconfigured as the needs of the deployment changes. From MOUT training facilities to storage warehouses and offices, EverBlock and EverBlock Flooring provide militaries cost saving flexibility. Build entire complexes made to resemble homes or apartments for training operations. Reconfigure the space to offer a unique and challenging training center for military personnel.